During Juno’s time at Jupiter, we will have the fantastic opportunity to study the most powerful aurora in the solar system. An aurora is light emitted by atoms and molecules that have been excited through collisions with very energetic particles that enter a planet’s atmosphere along the planet’s magnetic field lines. The generation of Jupiter’s aurora is vastly different to the processes that create the Earth’s aurora and by studying this, we can gain a better understanding of space weather and how the planets interact with it. In the case of the Earth’s aurora, the process starts off at the sun, where particles are constantly flowing out into space and dragging the Sun’s magnetic field with them. The particles and magnetic field together are known as the solar wind. 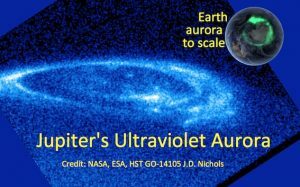 The Earth’s aurora is generated through the connection between the solar wind and the Earth’s magnetic field; however the situation is very different at Jupiter. Jupiter’s magnetosphere – the magnetic bubble which surrounds Jupiter. Credit: NASA. The volcanic moon: Io. Credit: NASA. The generation of the aurora is different at Jupiter for two main reasons. Jupiter’s magnetic field is incredibly strong, about ten times the strength of the Earth’s magnetic field. If it were possible to view the invisible magnetic field lines that surround Jupiter, known collectively as the magnetosphere, they would fill an area in the night sky which was larger than the moon! The first reason is that Jupiter’s magnetosphere is full of charged particles, known as plasma. 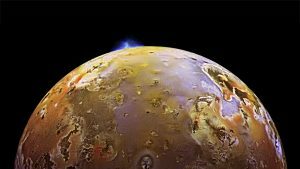 Unlike the Earth’s quiet moon, the Galilean moon Io has sulphurous volcanoes which eject one tonne of material per second that is quickly turned into charged particles. The second reason is that Jupiter’s magnetosphere is rotating very quickly. It spins with the planet, completing one revolution taking about 10 hours. Being fast and full of plasma makes Jupiter’s magnetosphere a very different environment to the Earth’s magnetosphere. Imagine you’ve made a line of people and asked them all to hold hands and you stand on the spot and spin them around you. Maybe you’re mean and try to spin them really fast and you’ll notice that the person on the end of the chain has to run the fastest to keep up. At some point they can’t run fast enough and eventually they break the chain. This is essentially what happens at Jupiter to create the aurora, but instead of people there is plasma, and instead of arms there are magnetic fields. In space plasma physics charged particles and magnetic field lines are intertwined. So as the plasma spins around Jupiter (just like you were spinning those people around), the magnetic field lines (everyone’s arms) get dragged with it all. All this stuff is spinning around Jupiter, moving faster and faster as we move away from Jupiter until it cannot go any faster, causing the plasma and the magnetic field lines to slow down (just like that person who was stuck on the end that couldn’t keep up). The consequence of having charged particles moving at different speeds relative to each other is that they make electrical currents. The electrical currents send electrons down the magnetic field lines and they accelerate into the Polar Regions, smashing into Jupiter’s atmosphere and creating the main auroral emission. The generation of the main auroral emission is thought to be very well understood, but it behaves strangely when the pressure of the solar wind increases. When the solar wind pressure ramps up, Jupiter’s main auroral emission has been observed to brighten, which is opposite to the expected behaviour calculated in models. If Juno is lucky enough to be at Jupiter during increased solar wind pressure, we will be able to collect measurements from inside the magnetosphere and pin-point the processes behind this strange behaviour. Not only does Jupiter have main auroral emission, there are also the footprint auroras from the Galilean moons. Through the direct connection of magnetic field lines to the moons, Io, Europa, Ganymede and Castillo, spots and arcs are created in Jupiter’s aurora. The footprint aurora are crucial in creating models of Jupiter’s magnetic field and alongside the measurements taken with Juno, we will be able to create amazingly accurate models of the magnetic field to understand the whole system more completely. The final component of Jupiter’s magnetic field is the most controversial. Poleward of the main auroral emission is the polar aurora which is highly variable – scientists observe arcs, spots and patches. Exactly how this aurora is generated is not fully understood. Some researchers believe that the processes that occur here may be similar to the interaction between the Earth’s magnetosphere and the solar wind. Others believe that the magnetosphere of Jupiter is completely closed to the solar wind. Already we have tantalising evidence that Jupiter is connected to the solar wind but exactly how, we do not know. And again this is where Juno’s data will be the key in discovering the answers to one of the most pressing questions in space physics. We can apply what we learn about Jupiter’s magnetosphere to the Earth’s magnetosphere. Although the magnetosphere’s of Jupiter and Earth are different, studying other planets provides a natural laboratory in which the conditions of the experiment change at each planet. Understanding magnetosphere’s is not only important for the satellites and astronauts that orbit the Earth, but will be crucial for future space exploration and the potential industrialisation or colonisation of Jupiter’s moons. Rosie is a research student working towards completion of her doctoral degree with the Radio and Space Plasma Physics research group in the Department of Physics and Astronomy. Her research focuses on the infrared aurora of Jupiter using data from the Very Large Telescope (VLT), Chile, and the NASA Infrared Telescope Facility (IRTF), Hawaii.